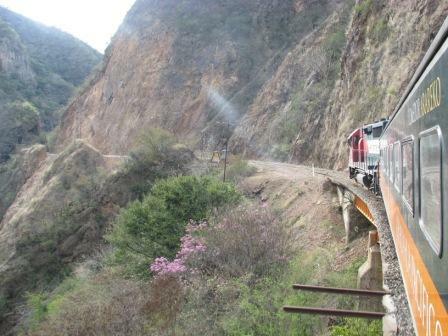 The Ferrocarril Chihuahua al Pacifico, or El Chepe for short, is one of the world's most spectacular rail journeys. Connecting Chihuahua in north-central Mexico to Los Mochis on the Pacific coast, the railway runs for 655km south-west through the Sierra Madre Mountains and skirting the spectacular Copper Canyon (Barranca del Cobre). The railroad was originally conceived to establish the shortest rail link between Kansas City and a Pacific port, but delays in construction meant it took almost 100 years to complete. Today it is the only functioning railway left in Mexico but has become a major tourist attraction. Leaving Chihuahua, the train gradually ascends through the territories of the Mennonites and Tarahumara Indians before reaching the high point after Creel. At Divisadero, the train stops for 15 minutes to allow passengers to walk to the edge of the Urique Canyon, one of the most spectacular of the canyons with a breathtaking view 1200 metres to the valley below. The Copper Canyon is larger and sometimes deeper than its famous northern neighbour, the Grand Canyon, being 50km long and up to 2,000 metres deep. After Divisadero, the train rides along the most spectacular part of the railway, gradually descending for 100km passing over and through the majority of the 39 bridges and 86 tunnels constructed for the track, including a 180 degree turn within a mountain tunnel that descends 100 feet. In this section, the journey is best experienced leaning out the doors at the end of each carriage and soaking up the wind-swept vistas as the train clings to the cliff edges. Returning to lower altitudes, its worth disembarking at El Fuerte, a sleepy and attractive colonial town, rather than going all the way to Los Mochis after dark. The total journey takes 13 hours, but can be broken up at a number of stops along the way to further explore the canyons. Organised group tours: Click here to see 5 tours to Mexico which may include El Chepe - Copper Canyon Railway.